A marvel of engineering and design, the Mavic Air was built to go wherever adventure takes you. 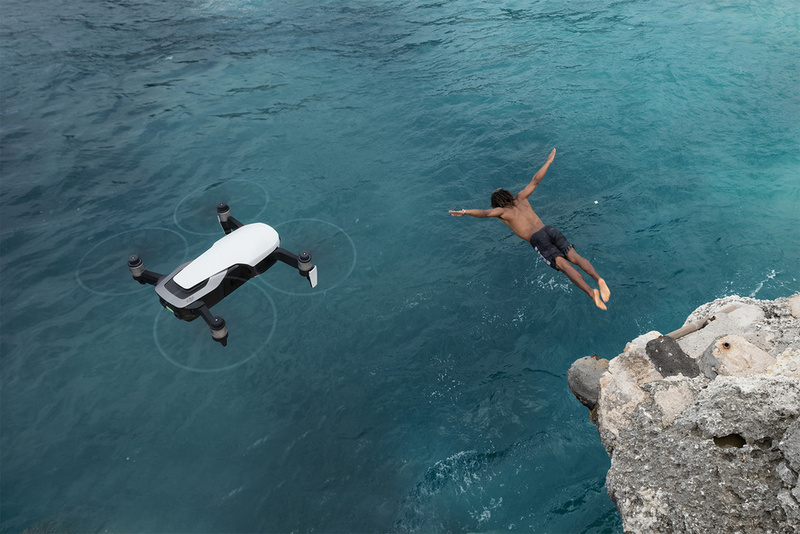 Inheriting the best of the Mavic series, this ultra portable and foldable drone features high-end flight performance and functionality for limitless exploration. 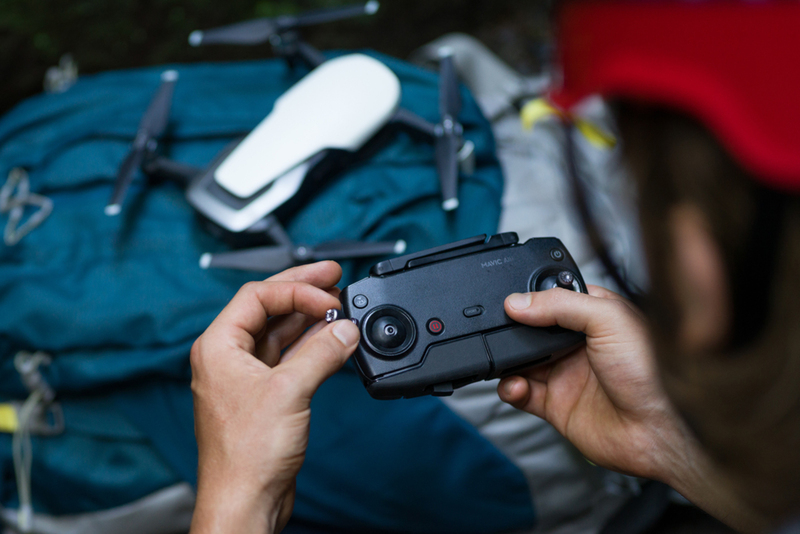 The ultra-portable and foldable DJI Mavic Air Drone features a 3-axis gimbal stabilized camera with a 1.2/3" CMOS sensor, which can capture 4K video at 30 fps and 12MP still images. The Mavic Air has multiple flight modes, a top speed of up to 43 mph and has a maximum flight time and of up to 21 minutes. You can save your footage to a microSD card or to the 8GB of internal storage. The Mavic Air is the most portable DJI drone to house a 3-axis mechanical gimbal, with its angular vibration range reduced to 0.005°. Set in a triangular formation, gimbal dampeners help create even steadier shots. In addition to Horizontal, Vertical, and 180° panoramas, the Mavic Air stitches 25 photos together in just eight seconds to create crystal-clear 32 MP Sphere panoramas.1 View them from an immersive perspective with DJI Goggles. The Mavic Air’s onboard camera integrates a 1/2.3” 12-megapixel CMOS sensor and an f/2.8 lens with a 35 mm equivalent focal length of 24 mm to shoot high-quality photos and videos. Expressing geometric precision, the Mavic Air's arms fold flush against its aerodynamic chassis. Magnesium alloy brackets reinforce the seven on board cameras, and the primary gimbal camera is recessed for better protection while the rear vents dissipate heat efficiently. ActiveTrack can sense up to 16 selectable subjects2 simultaneously, letting you choose the right tracking subject on the go. With higher tracking precision and broader scenario applications, ActiveTrack can follow targets even when they're running, jumping, or cycling. Choose from six different QuickShots — Rocket, Dronie, Circle, Helix, Asteroid, and Boomerang. All are just a tap away and will get you those epic selfie drone videos without needing to think about composing your shot. Share your new creations to social media through the DJI GO 4 app instantly. Besides dual IMUs, FlightAutonomy 2.0 has more redundant modules to increase the Mavic Air’s safety level. The Vision Compass will assist the navigation system to estimate flight direction when the compass experiences interference. When only one direction of the front, bottom, or rear vision systems is functioning normally, the aircraft will still position itself successfully. There are two sets of sensor fusion algorithms based on two independent hardware platforms. When an error occurs to one set of algorithms, the aircraft will switch to the other pair seamlessly to resume normal functionality. Mavic Air Intelligent Flight Batteries are made with high-density lithium, offering a substantial flight time of up to 21 minutes for all your adventuring needs. The application of FOC sinusoidal drive architecture ESCs provides the Mavic Air with a smoother motor commutation process and higher overall efficiency of both motors and ESCs. Feel the rush and thrill of first-class drone flight with maximum speed of 68.4 kph in Sport mode. A new Wi-Fi video transmission system supports dual frequency bands of 2.4/5.8GHz6 and a 720p live view from up to 4km away.